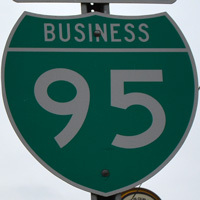 Interstate 95 has one remaining active business route and several former routes. A chamber of commerce brochure for Brunswick from the early 1990s showed Business Loop I-95 on its color map of the area. The route was displayed along side U.S. 17 & Georgia 25 east from Exit 29 to the Sidney Lanier Bridge and city of Brunswick. The route returned to I-95 by way of Georgia 25 Connector (Golden Isles Parkway), a busy commercial arterial leading north from U.S. 17 to I-95 at Exit 38. If the route was ever posted, it was not signed in the field by 2006.
Business Loop Interstate 95 followed Georgia 99 east from Exit 42 to U.S. 17 north through the city of Darien. It re-connected with Interstate 95 at Exit 49 via Georgia 251. The loop appears on the 2013 Georgia Highway Map, but is only signed on southbound guide signs at Exit 49. 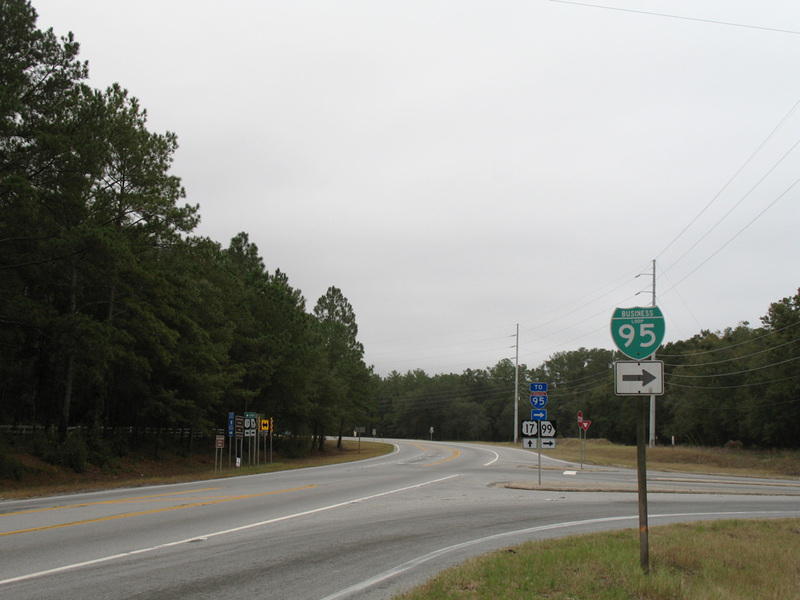 The lone shield at the split of GA 99 south from U.S. 17 south was replaced with an I-95 trailblazer by December 2013. 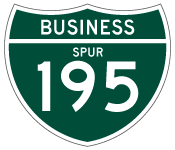 Traveling 16 miles west from I-95 through the city of Fayetteville, Business Loop I-95 branches north from I-95 at a wye interchange (Exit 40) to merge with adjacent U.S. 301 near Hope Mills. The tandem comprise a four-lane divided arterial northward to Eastern Boulevard. Eastern Boulevard angles the pair northeast with controlled access to an interchange with NC 87 before curving northward across several railroad crossings and signalized intersections to NC 24 & 210 (Grove Street). 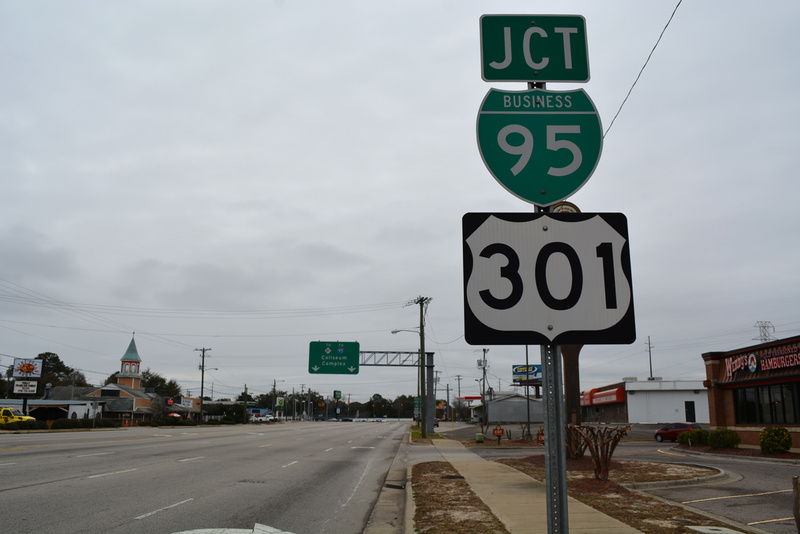 A freeway takes the remainder of the route east from the Cape Fear River to Eastover, where U.S. 301 splits, and a wye interchange (Exit 56) with I-95. The longest Interstate business loop at one time at 49 miles in length, Business Loop I-95 through eastern North Carolina was established in the late 1970s and decommissioned in 1988. The business route overlayed U.S. 301 from the town of Kenly (Exit 107) northeast to the city of Wilson. The four-lane highway circumvented the town of Elm City and bisected Sharpsburg to a bypass of central Rocky Mount. The return to I-95 was made by North Carolina 4 west from near Battleboro to a trumpet interchange (Exit 145). Long since replaced, guide signs along the U.S. 64 freeway across Rocky Mount alluded to the former Business Loop I-95 in 2001 with visible label scars on signage for Exit 468A to U.S. 301 Bypass. Expected traffic congestion forecast by a planned six month closure for the reconstruction of Interstate 95 in 2000 led to at least two renumbering proposals involving I-95 and I-495 through Wilmington. One concept called for renumbering I-495 as the new mainline for Interstate 95 and designating the former route to the west as Business Loop I-95. The other would simply swap the two routes so that I-495 was the urban loop and I-95 was the bypass. Neither was never implemented due to concerns from Wilmington business leaders over losing I-95 as a route to Downtown. Gousha maps from the 1970s and 1980s displayed Spur I-95 / Spur U.S. 13 extending east from the freeway connector to Pennsylvania 413 in Bristol. 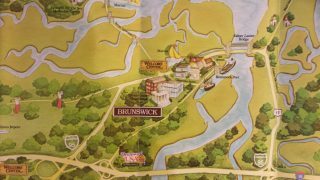 This proposal was a remnant of an unbuilt freeway corridor planned for I-95 from Exit 40 to U.S. 13 near Morrisville.2 The Spur I-95 reference was likely a cartographic error that persisted for many editions of Gousha’s North American Road Atlas. The directional T interchange built between Interstate 95 and the PA 413 connector will eventually represent part of a new alignment for I-95. Construction through 2018 on the PA Turnpike / I-95 Interchange Project adds ramps between the north-south freeway and east-west toll road to complete a reroute of I-95 away from Trenton and onto the New Jersey Turnpike near Florence Township, New Jersey. Briefly in the 1960s, “Spur Interstate 195” extended east from the freeway end of I-195 between State Road 907 (Alton Road) and A1A (Collins Avenue north / Indian Creek Drive south) in Miami Beach. A photo showing a guide sign with the designation appeared in an annual report published by the Florida Department of Transportation during this era. Today, this short alignment is marked as Florida 112, which runs concurrently with I-195 west as a hidden designation to the Airport Expressway. 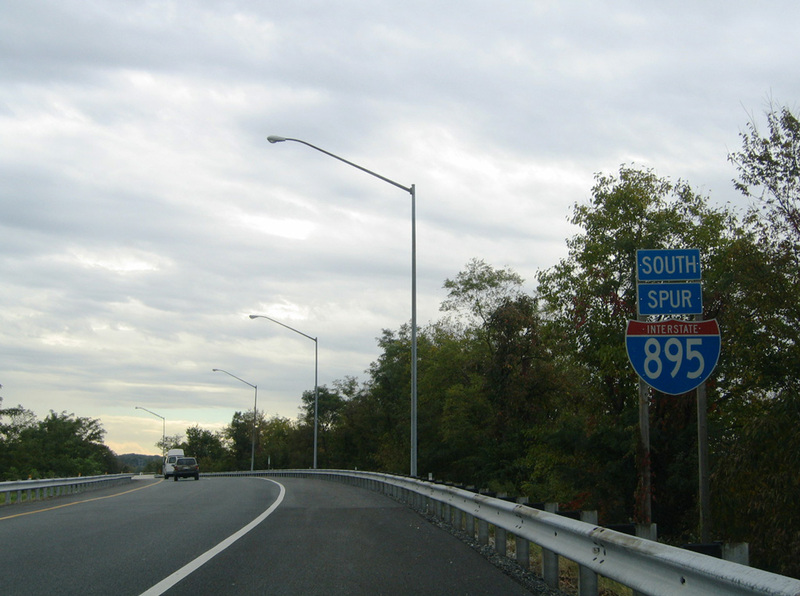 The Maryland Interstate spurs are not business routes, but instead unsigned connector routes joining the parent route with other area freeways. 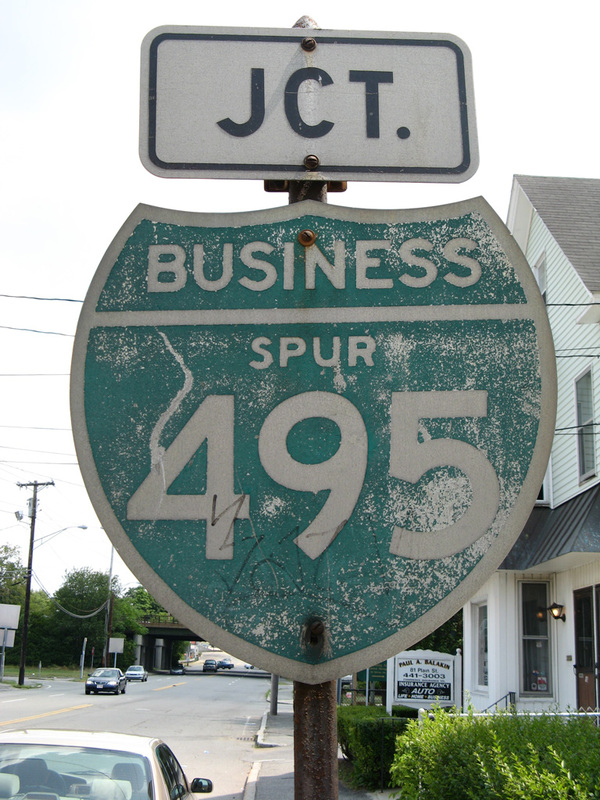 Spur I-495 is noted in the Maryland route log as Interstate 495X. Known as Cabin John Parkway, it is a limited access connector joining wye interchanges with Interstate 495 (Capital Beltway) at Exit 40 and Clara Barton Highway at Glen Echo. 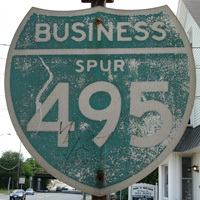 Business Spur I-495 was the designation given to the freeway spur from U.S. 3 and Interstate 495 into the city of Lowell. Named the Lowell Connector, it is an older limited-access roadway with a 55 mile per hour speed limit and numbered interchanges. The 3.1 mile rout provides fast access to the city center and the University of Massachusetts from the area freeway network. It concludes at a signalized intersection with Gorham Street (Exit 5C). The lone remaining trailblazer for the route was taken down from the city of Lowell after 2007. The Lowell Connector is unnumbered otherwise. Spur I-895 provides a connection between I-895 (Harbor Tunnel Thruway) in Baltimore and both Interstate 97 and Maryland 2 (Ritchie Highway) at Ferndale. 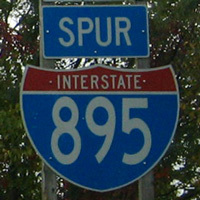 A lone Spur shield assembly was posted at the wye interchange with I-895 south, but it was removed by 2007. Ground level signs posted along both prongs of the spur northbound otherwise reference only the connection with I-895 north and not the spur designation. MDSHA refers to the routes as I-895A and I-895B. US 13 Expressway (Pennsylvania), The Roads of Metro Philadelphia (phillyroads.com). Hogan, Jay. “Interstate Business Route.” Online posting. 07 Feb. 1999. misc.transport.road. Page updated September 20, 2016. Brunswick, Georgia Chamber of Commerce map showing the route of Business Loop I-95 in Glynn County, Georgia. The last shield posted along the Darien, Georgia business loop directed traffic back to I-95 along Georgia 99. Photo taken 12/20/06.